inGallery allows you to display any Instagram media on you website in a highly customizable galleries. User friendly, flexible, customizable - it's an essential plugin to show your website visitors your lifestrem, portfolio, travel pictures or enything else you can imagine. Build a responsive gallery and manage gallery style easily with intuitive visual editor. No programming knowledge required! 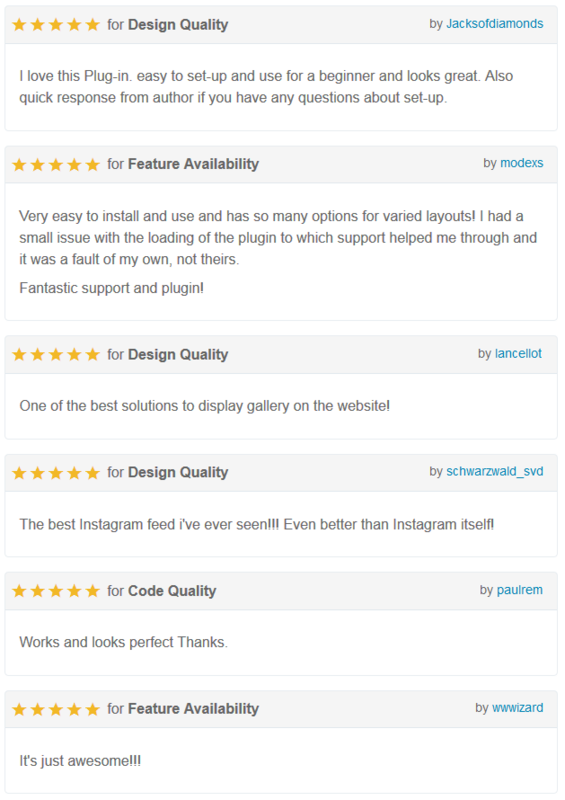 You can choose between 2 most popular layouts to fit the gallery into your website style and control how many rows, columns and how much gutter you want to display Instagram items. Here are examples of how you could use inGallery for WordPress. You can use inGallery to display an Instagram user feed on your website to show your website visitors your live feed of photos and videos. Organize your gallery media content into albums which whill help you to better intoduce your Instagram content to your website visitors. If you are doing some handmade or other products/services, you can use inGallery to display your works on your website. It can be either photos or videos or both types of media. There are 2 premade layouts already included in the plugin. There are 5 premade styles already included in the plugin. Wondering which license is best for you? Here is all the info you need! Most popular license, the Regular License allows use of the item in one single end product which end users are NOT charged to access or use. You can do this directly or, if you’re a freelancer, you can create the end product for one client to distribute free to its end users. You can charge your client to produce the single end product. Distribution of source files is not permitted. Copyright © 2016-2018 Maxiolab. All rights reserved.